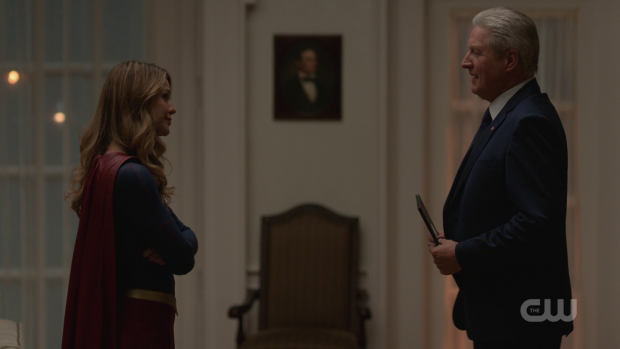 Supergirl continues to develop the anti-alien sentiment in the wake of the public learning that the President has been lying about her true origins. Paranoia, fear and hatred are three words that have defined so much of the first two episodes of this season. There is a lot of tension in the world this show inhabits because many people assume they all aliens are inherently hostile. The comparisons to the current political climate are obvious which makes this story disturbingly real and relevant. The opening scene sets the tone for the episode. There are two groups of protestors outside the White House; one side is defending the president and the other opposes her as well as all other aliens. It doesn’t take much for the situation to turn violent and Kara puts a stop to that by standing in the middle of them holding up a fallen American flag. It’s a great image and works on a thematic as well as a character level. This season is clearly going with the idea that Supergirl is an inspiration to the world who stands in the middle of a conflict to show people a better way. It’s also consistent with what Kara’s personal mission statement is. She wants to unify people by encouraging them to see what connects them rather than focusing on what makes them different. Having her in the middle of two warring factions is a physical representation of that mission statement and continues to establish her as the beacon of hope that the world needs even if people don’t realise it yet. As you might be able to tell from this scene the storytelling in this episode isn’t subtle but I don’t think it’s trying to be. There is a definite aim to make a particular point about the state of our world through exploring it in a fantastical setting. Gestures are large scale and obvious with opinions being freely shared to get the point across. The lack of subtlety doesn’t mean that the narrative isn’t complex in its own way. Those angry at President Marsdin for lying to the world all this time do have a point in some ways as she is in clear violation of the article in the constitution that states the President must be born in America. She wasn’t so it’s understandable that people would feel betrayed. One side of the issue that isn’t shown is those who feel betrayed but don’t have any ill will towards aliens though admittedly there’s really nothing to that stance outside of that. I would have liked at least a mention of it to show that a range of opinions do exist and the world is even more complicated. Those who hate and fear aliens feel that their point of view is validated by the world learning that the President wasn’t being honest with them. They see it as an infiltration at the highest level of government and a confirmation that aliens are on Earth to take over the planet. The truth is far more complicated than that as aliens are people with their own motivations and agendas as anyone is. As a story that is being told in an action/adventure superhero series this is a difficult one as there is no real tangible threat that can be defeated. Unless the writing gets really bad then it’s unlikely that Kara will be able to change the minds of everyone who hates aliens by the end of the season so this is an ongoing issue that can’t really be beaten. As such it’s hard to direct the focus to any one cause of the problem. Last season had Reign who was a tangible threat for example or season 2 eventually had the Daxamites but Kara is battling against prejudice and it’s an impossible thing to fight effectively. This is probably why the writers compromise by having antagonists who take advantage of the situation without directly causing it and this works really well. The obvious ringleader is Agent Liberty who knows exactly what to say to encourage desperate people into action. There are those who are struggle to find employment and are looking for someone to blame so aliens are as good a scapegoat as any. Agent Liberty preys on that sentiment in order to gain followers and it’s clearly not a difficult thing to do judging by how quickly people buy into what he has to say. 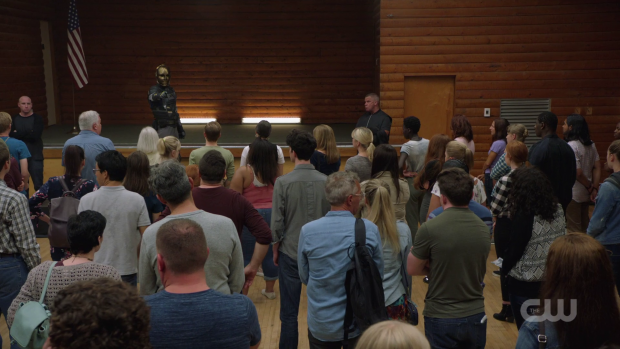 J’Onn being present at this rally is a good idea because it allows one of the characters we know to be in the viper’s nest so to speak and David Harewood perfectly delivers the terror associated with knowing that everyone in that room hates him for what he is. Agent Liberty being masked during this scene is an odd choice because it creates a disconnect between him and the crowd. Sam Witwer’s vocal performance is first rate but the fact that we can’t see his face raises a few questions around why people would trust him. The mask suggests to me that he has something to hide yet he preaches about transparency so it doesn’t quite add up to something entirely satisfying even if the scene itself works in terms of showing how easily he can manipulate the situation. He will be a formidable enemy because stopping him doesn’t actually solve the problem so there’s a built in fail-safe in that sense. Mercy and Otis are affiliated with Agent Liberty but are also acting alone to some extent. After Otis’ capture last week Mercy is forced to act alone and her objective is to expose hidden aliens by hacking into the software that controls the image inducers. Her attempt fails but isn’t entirely unsuccessful as she is able to cause a brief interruption to the network which renders aliens visible in their true form for long enough to do some damage. 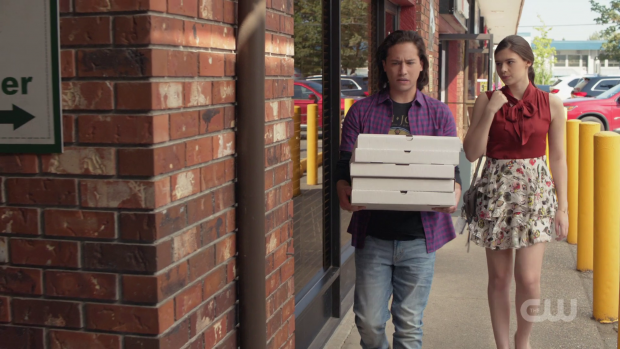 The example we get of this is Brainy who is buying pizza from a restaurant he has been to a number of times but finds himself no longer welcome once the owner knows the truth. He goes from being a valued customer to an enemy in the space of a few seconds and that’s not something he is able to come back from. Earlier in the episode he talks about how this moment in history will pass and lead to something more positive which offers very little comfort in terms of what has to be dealt with in the present day. Brainy receives a very clear lesson in how far off the future truly is when he becomes a victim. It’s easy to approach the situation from a purely analytical perspective when safe inside the DEO but outside in the real world he’s just another alien hated and feared by many. The effect this has is profound as shown by him having difficulty focusing on a given problem to predict probabilities accurately. Alex points out that his feelings have got in the way which is new territory for Brainy and shows how valuable a character he can be over the course of the rest of the season if he can continue to learn, grow and evolve based on his experiences in this time period. Using him as the practical example of Mercy’s efforts is a great idea as it shows that what she does has consequences that actually mean something on a large scale while keeping the attention focused on the familiar characters and how they react to what is going on. Even though Brainy is the only one we see it’s clear there are similar scenarios playing out elsewhere which could lead to a very dangerous situation for aliens who previously felt safe enough concealing themselves. Mercy is given added layers in this episode through her connection to Lena. There’s a palpable sense of betrayal to this relationship as Lena talks about how Mercy was the closest thing she had to a big sister. Her mother wasn’t nurturing in any way but Mercy was someone who taught her important life lessons and helped shape the person she is now. This is all relayed through exposition but it adds extra weight to the conflict that takes place because the audience is now aware of the history that exists between them. Lena seems more hurt by Mercy’s life choices and this comes across when they face off against one another. Their interactions feel more like bickering than anything else and I get the feeling that they are only in opposition to one another because they have different goals at this point. It’s an interesting relationship and having them using the gauntlets on Lex’ power armour helps set them up as two sides of the same coin. This definitely feels like a sign of things to come as these characters will likely continue to face off over the course of the season. The show is wasting no time in giving Nia some heavy duty storytelling for Nicole Maines to sink her teeth into. Her interaction with Brainy works really well both as mystery foreshadowing and an introduction between two characters in its own right. She comes to his defence because she can’t stand to see such open hatred shown towards another being whether they happen to be Human or not. She makes this known confidently and shows that she’s not afraid to stand up for others even if there is risk to herself. Brainy is understandably grateful and finds her familiar so this is clearly the beginning of a longer form storytelling. These mystery teases are often tedious but this is the best way to do them as the characters are kept at the forefront so this one works well. It seems that part of Nia’s purpose is to increase the overall relevance of the DEO as a location that the show can go back to and use to great effect. James has taken the stance that CatCo will report the facts without any bias creeping in but Nia feels that they have a responsibility to stand up for those who don’t really have a voice. James sees this from her point of view but also from a business standpoint. He’s reluctant to have the outlet take a stance on the issue because it might alienate a section of consumers who don’t relate to it where those who agree with Nia’s feelings won’t be driven away because opinion pieces aren’t being written. This sort of storytelling is more in line with what I wanted from James when he took on this position rather than wasting time with the largely pointless Guardian storyline. He gets something interesting to so within the framework of the show, develops along his own lines rather than being defined by how he relates to Kara, Lena or anyone else that he comes into contact with and feeds into the overall narrative in his own way at his own pace. It’s good stuff and definitely should continue. Nia makes it known to James in confidence that she is transgender and uses that to explain the empathy she has for what aliens are going through. She understands what it’s like to feel as if she didn’t belong and she wishes that she had a media outlet telling her story to champion the cause. It’s a good reveal because it shows that Nia isn’t ashamed of who she is but also knows that she might not be accepted so is careful about who she tells. It’s unclear if Nia as a transgender woman will play into the overall narrative in any major way or simply be another detail about her that shows how diverse this show is and how accepting it is of people from all walks of life but for now it is being handled with appropriate sensitivity. Her concerns are almost immediately proven right judging by an innocent office prank that ends up being a lot more hurtful than intended. What seemed to be a joke from one point of view turned out to be offensive from another which shows the widespread complexity of the issues being dealt with here. Nia keeps the details of her life private so that she doesn’t have to deal with things like that in her life. This also shows that prejudice is everywhere including the locations in this show that might be considered havens. James is quick to say that there’s no hate in the office as a rule but it doesn’t stop people thinking a certain way or acting on those feelings so it helps establish that it’s a systemic issue infecting every part of the city. Similarly this sentiment creeps into the DEO through Jensen who is easily swayed by Mercy. Even though he’s too easily swayed it still furthers the idea that there is no escaping what is happening. 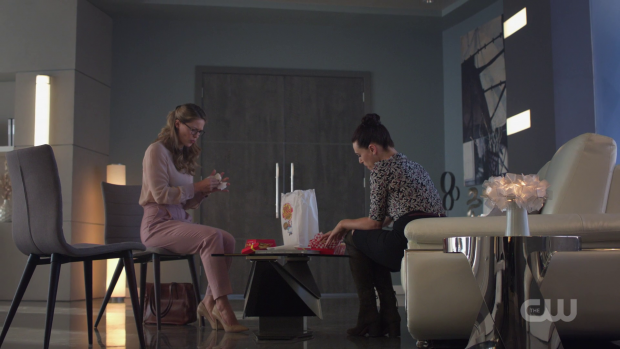 Even though this episode is more focusing on exploring the world around Kara rather than Kara herself there still exists plenty of opportunity for her to shine. Time is devoted to reminding viewers of her close friendship with Lena and most notable is the sequence where she is stuck in LCorp without having an opportunity to sneak off and change into her costume. She has to do improvise ways to use her powers without being caught as she desperately tries to sneak off without Lena suspecting anything. 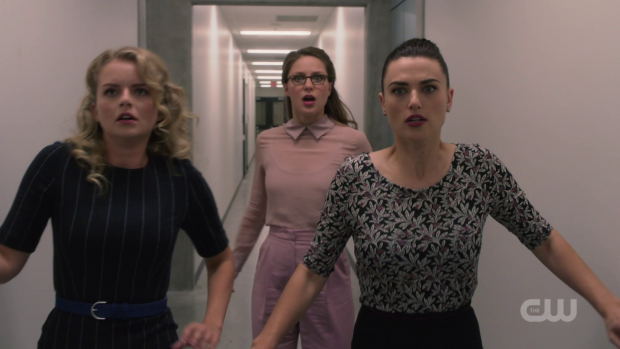 It’s a lot of fun and makes good use of the still tedious detail of Lena not knowing Kara’s secret. It’s always good to see Kara’s ability to improvise in tense situations and having her unable to use the full extent of her powers when there is danger all around is a really nice touch. If the episode had worked towards a resolution where Lena solved the problem all on her own then it would have been better but what we got was good enough. Kara’s speech at the end of the episode where she talks about tolerance and pledges to continue her work of setting an example to the world around her so that people might see a better way to live is brilliantly delivered by Melissa Benoist. There is real growth in Kara this season as she becomes more confident as a public figure and accepts the responsibilities that come with it. It’s a far cry from the timid rookie superhero of the first season and it feels very natural. If the writing continues to be as strong as this across the board then this season will definitely be a memorable one. An excellent episode that furthers the larger issues at play while keeping a tight focus on how this impacts the characters. 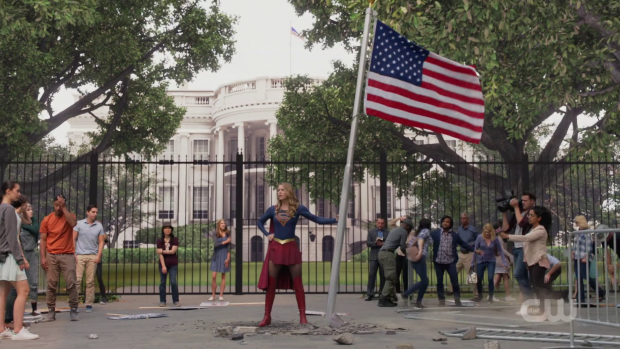 The opening scene sets the tone for the episode wonderfully with Kara standing between two warring factions holding the American flag as an unsubtle reminder of what unites the people It’s very in line with what Supergirl stands for and what Kara hopes to achieve in that role. It also sets the stage for the complexity of the issue as those who protest the president being dishonest have a point in the sense that she is in breach of the article in the constitution that forbids anyone not born in America from becoming president. In many people’s minds this validates their position and makes their behaviour acceptable in their view which is a difficult thing for Kara to fight. Agent Liberty, Mercy and Otis are there to take advantage of the sentiment that already exists which cleverly means that defeating them doesn’t actually solve the problem. This is readily apparent when Agent Liberty addresses people who are looking to place blame though there’s a disconnect created by him being masked and therefore dishonest to an extent so it can only work so well despite Sam Witwer’s engaging vocal performance. The impact on the characters is definitely felt through Brainy’s treatment at the hands of a pizza place owner when Mercy causes his image inducer to fail for a brief time. He experiences prejudice first hand outside of the relative safety of the DEO or the distance that comes with his historical knowledge. It has a profound effect on him that resonates powerfully throughout the rest of the episode. Nia confides in James about being transgender to illustrate a point about how CatCo should be standing up for the aliens who are being persecuted and don’t have a voice. It’s a great plot for both Nia and James because it makes great use of the CatCo setting as a way to move plot forward while providing opportunities for engaging character driven narratives. Lena and Mercy’s relationship helps add depth to Mercy as a character with the reveal that she was the closest thing Lena had to a big sister. Their interactions feel more like bickering which makes them so much more interesting to watch. 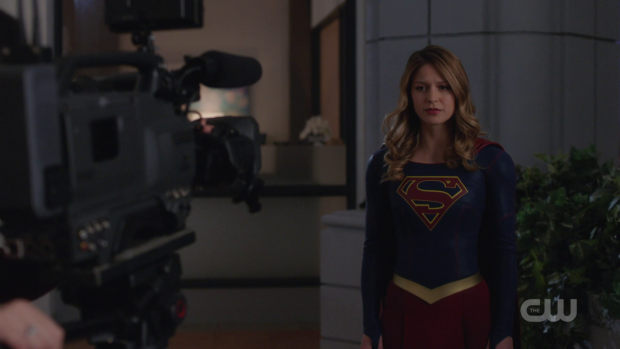 Even though the episode is more about exploring the world around Kara rather than Kara herself she still has plenty of opportunity to stand out such as the reminder of her strong friendship with Lena and having to think on her feet to use her powers when she has no opportunity to change into her Supergirl costume. As Supergirl she is settling into her role as a mature and inspiring public figure.